After Ricky pokes fun at Lucy's new hat, she jokingly puts on a loving cup he had planned to present to jockey Johnny Longden at a national Turf Association dinner. The problem is that Lucy can't get the trophy off her head. Ethel suggests a sliversmith, but the man refuses to make a house call. Wearing a veil over the loving cup in an effort to disguise it, Lucy and Ethel board a Lexington Avenue subway train and, of course, elicit more than their share of stares from the rush-hour crowds. When the pair prepares to transfer at the Bleecker Street station, Lucy gets caught in the pushing melee and is shoved back into the car. Assuming that she, like Ethel, has gotten off the train, Lucy asks a stranger: "Parden me, sir, can you tell me where the stairs are?" New Yorker: "You have to get off the train first." Lucy: "I am off." New Yorker: "You're telling me!" Lucy's veil accidentally comes loose and she tries to act nonchalant with the loving cup still stuck on her head. The scenes depicting Lucy "reading" a newspaper, hoping to look inconspicuous, are hilarious. She finally manages to exit at Flatbush Avenue (the end of the line) whereupon a crowd gathers. 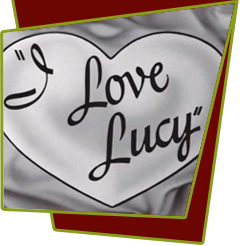 Lucy explains her plight to a cop who, dismissing his urge to take her straight to Bellevue, is nice enough to accompany her to the Johnny Longden banquet where Ricky has been waiting patiently for the arrival of the loving cup. Finally, Ricky presents the award to the champion jockey ... with Lucy still attached to it. Special Notes: There are tiny holes in the decorative design of the loving cup so that Lucy will be able to see and move around without hurting herself. This is the last time that the Club Babalu set is used during the series. During the summer of 1955, Desi Arnaz optioned Johnny Longden's life story for a possible motion picture, which was never made. Robert Foulk, who played a policeman in this episode would later appear as Roy Trendle on the CBS series, Green Acres.